We’re excited to announce some new initiatives in celebration of International Women’s Day – that will extend far beyond today. Tinder connects the community to good causes. While we want to help you connect with each other, we also want to connect you to causes that matter. 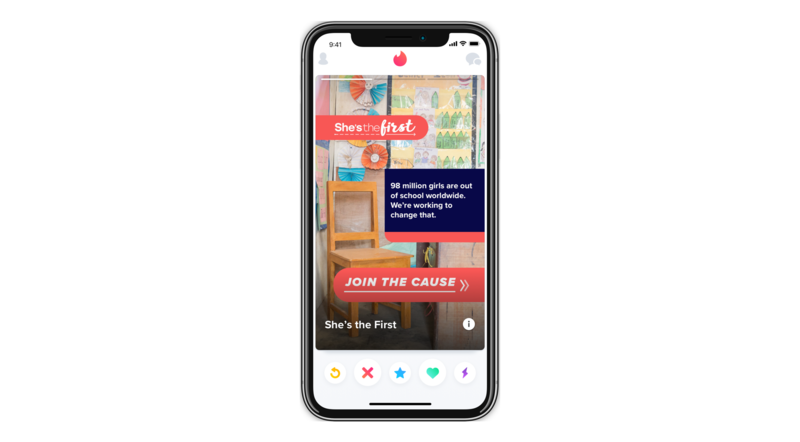 Tinder will offer up to $1 million in in-app advertising for eligible nonprofits as part of an ongoing effort to connect the Tinder community to causes around the world. And today, in celebration of International Women’s Day, we’re kicking it off with a campaign for She’s The First – an international organization fighting gender inequality through education. For our first round of applications we’re specifically asking to hear from organizations dedicated to bettering the advancement and well-being of women, but we welcome all nonprofits to apply for in-kind advertising on Tinder. Please visit here for details. Tinder opens doors for women in the workforce. That’s why we’re opening our doors for women in tech—literally. On March 26, Tinder will host a panel discussion and meet-and-greet featuring women making an impact across Los Angeles’ tech scene. We’re committed to doing our part to drive #balanceforbetter in our workplace and in our industry—and that means opening doors for women at every stage of their careers. For our 2019 internship program, we are targeting 65 percent of positions for female interns, because a foot in the door is just as important as a fist through the glass ceiling. Tinder commits to closing the pay gap. We believe change is necessary and we know that real change—the kind that endures—must come from within. In 2018, we partnered with an outside firm to do a comprehensive pay equity audit to make sure that there weren’t disparities at Tinder. We’re excited that all statistical evidence indicates that Tinder has achieved pay equity, and we are committed to maintaining our leadership in this space.